These notes give a detailed step-by-step procedure for a complete disassembly, reassembly, and adjustment of the Felt & Tarrant manually-operated Comptometer. The notes are based on the Model 3D11 from the 1950s, but can be used with any of the earlier models H, J, and M with only minor variations. The 3D11 was manufactured in Chicago from 1950 to 1961. It was the last and the most complex of a long line of Felt & Tarrant manually-operated Comptometers which had its beginnings in 1885. The machine builds on the basic "rock-frame" mechanism that was first introduced in 1920 on the Model H. The Model J from 1926 is essentially the same as the Model H, except for some modifications to the carry gear and escapement levers, and a re-calibration of the springs to provide a lighter touch. Model J also introduced two additional components - the accumulator latch and the latch lifter - which were sometimes retro-fitted to Model H machines during major overhauls. The Model M from 1938 added leading-zero shutters on the numeral wheels and latches on the subtraction levers, and further refinements to the touch. The rectangular "copper" casing was replaced with a more rounded "Art-deco" design. 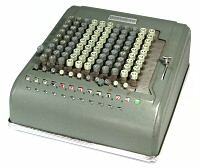 The final changes in the 3D11 (c.1950) were in the trigger touch-off mechanism and the column locks, which were modified to provide automatic resetting during multiplication and division. Apart from these gradual additions, the basic Comptometer mechanism continued more or less unchanged from 1920 until the end of production. The notes following have been prepared and refined during the rebuilding of a number of Felt & Tarrant machines of various types, and may provide a useful guide to anyone faced with a similar task. The Comptometer is a complex machine with many interactions and unexpected subtleties. Rebuilding requires great care and attention to detail, and should not be undertaken lightly. The procedure following works well for me, but comes with no guarantees as to its efficiency or appropriateness. No responsibility will be taken for any consequences arising from the use of these notes by others. The notes are intended to be read in conjunction with the Technical Description on the Model J Comptometer page, and with the more general information in the Notes on overhauling a mechanical calculator. The Technical Description explains the operation of the basic Comptometer mechanism and illustrates all of the major components and assemblies, while the Notes on Overhaul describe more general techniques for disassembly, cleaning, and rebuilding. Details specific to the 3D11 are described in the notes following. Please study this material before commencing your overhaul, and refer frequently as you proceed. To adapt the notes following for a Model H, J, or M, you should simply ignore the references to parts which are not present in your machine. Features of the earlier models which are absent from the 3D11 (eg the column lock retainer and the bell) are described and illustrated in the Model J pages. I would be happy to receive feedback, comments, or suggestions via the enquiry form. Disassembly does not require any special tools, although a good pair of bent-nose tweezers or fine pliers will be found useful. It is strongly recommended that you keep the parts in column order during disassembly and cleaning. The extra time taken will be saved many times over by avoiding trouble in reassembly and adjustment. Accumulators, for example, were selected on assembly according to the angular (mis-)alignment between the pinion and the accumulator gear, and may cause significant problems if paired incorrectly. It will take about 3-4 hours to completely disassemble a Comptometer in an orderly fashion, keeping the parts in their column groupings. Print a copy of these notes, and tick off each step as it is completed. Print the frame plate outline drawing (PDF file, 64kb) to show the location of the 33 mechanism cross-shafts. Prepare a set of numbered bags or containers to receive the parts in column order. Column 1 is on the right. Unscrew and remove the top of the clearing handle. Pull off the error release button (front) and the Mul/Div button (left). The buttons are retained by spring-loaded ball catches which may be stuck or rusted. Stand the machine on its left-hand side and remove the small screws around the edge of the baseplate. Some of these screws will probably be missing, as they tend to work loose and fall out. Set the machine back on its feet and lift off the cover. Invert the machine and set the keys down on a soft cloth. Remove the 4 screws through the rubber feet and lift the baseplate away from the mechanism. Set the machine back on its internal feet. Remove the cross-shaft retainer plates (metal or fibre-board) from the sides of the mechanism (3 screws each side). Clear the machine. From the right-hand side, push the intermediate gear shaft 7 to the left to clear the shutter actuating lever in the rightmost column (shown on the left in the photo opposite), but not so far as to release the intermediate gear. The shutter actuating lever has a long invisible arm on the left-hand side with a roller at the bottom. Tilt the lever so that the roller moves rearwards, then upwards, then forward, then lift it out in front of the hub of the intermediate gear. If the roller catches on the carry gear and will not move upwards, it can be released by turning the numeral wheel slightly. Withdraw shaft 7 further and drop the intermediate gear down into the space between the large carry gear and the frame plate to its right. The top of the gear should be just below the top of the rock frame plate. Lift out the subtraction cutoff latch release lever (on the right in the photo). The top end of this lever is hidden between the numeral wheel and the frame plate to its right. The lower end has a fork which fits over a wire in the rock frame, just below its top spacer rod. Pull the bridge of the lever forward, ease the top arm past the shutter operating tab, and lift out. Repeat the process in the remaining columns. Insert a short temporary pin (eg the shank of a 7/64" drill) at the right-hand end to support the rock frame as wire 7 is withdrawn. Leave wire 7 in place to support the frame at the left-hand side. (If you have the facilities, it is convenient to make up a couple of short temporary pins of 7/64" (0.108") diameter to support the rock frame during removal and reinstallation). Release the clip at the right-hand end of the rock frame toggle pivot wire 4. Pull the rock frame forward, withdraw the wire to the right, and recover the helper springs. Press any key to release the detaining toggle. Lift the front of the machine and remove the support wire 3 which passes through the slots in the rock frame actuating links. Pull the rock frame forward and disengage the forked links from the pins on the rock frame plates. Place a suitable block under the front of the machine so as not to damage the links when putting the machine back down. Support the rock frame with one hand and remove wire 7 and the temporary pin. Hold the rock frame at each end, lift it straight up as far as it will go, and pull it forwards to clear the duplex levers. Rotate the frame until the two locating flanges (top centre) are clear of the main frame plates, then push it across to the right. The movement is only about 1mm, just enough for the toggle levers to clear the toggle link rivets. Sit the leftmost escapement lever over the toggle link mounting point, as illustrated, then swing the top of the rock frame forward so that it passes under the top spacer bar E. Lift out carefully to avoid catching on the carry levers. Although it may seem impossible at first, the rock frame can actually be removed and replaced quite easily after a bit of practice (and you'll get plenty of practice by the time you've finished). Problems may be caused by the actuating links not fully disengaged, the toggle levers catching on the link attachment rivets, or an escapement caught on a duplex lever. The latter can usually be released by lifting and careful jiggling. Lift out the intermediate gears and put the rock frame assembly aside for later. The numeral wheels and accumulators. Starting from the right-hand side, unhook the forward end of the stiff spring between the subtraction cutoff lever and its latching lever. The latching lever is part of the shutter assembly, and the spring is just below the numeral wheel shaft 9. Use a pair of fine pliers to turn and unhook the spring to avoid deforming the loop. Withdraw the numeral wheel shaft 9 one column to the left and remove the numeral wheel and shutter assembly towards the front. (Push the curved shutter reset link out of the way if necessary). Continue to the end. Loosen the screw at the right-hand side of the top front spacer bar E. Push the front lip of the spacers down just enough to free the carry lever spring retainer wire 8. Withdraw the wire and release the springs. Note the location of the accumulator backstops and their torsion springs on wire 6 at the right of each column. Raise the front of the machine and carefully unhook the bottoms of the springs where they pass over the frame plate. Withdraw the backstop wire 6 gradually to the left and remove the backstop and spring, the carry lever assembly, and the accumulator latch lifter (between the arms of the carry lever). Note that column 1 has a stronger backstop spring. Withdraw the accumulator wire 5 to the left and remove the accumulators. Lift the clip at the left-hand end of the shutter reset wire 10 and withdraw the wire to the left. Remove the curved links. Disconnect the lower links from the pins on the rock frame actuator bell cranks (under) and lift out. Stand the machine on its back, with a suitable support to stop it falling backwards. Note the arrangement of the links on each end of the detaining toggle release bar 28. Lift the clip at the left-hand end and withdraw the bar to the left, releasing the links on both sides. Follow the detaining toggle release link in the left-hand column up to the detaining toggle pivot assembly. Unhook the left-hand spring (4mm) from the tab on the frame plate. Follow the detaining toggle links from the pivot assembly to the pinned arm on the rock frame actuating shaft 2. The toggle link is held in place by a slotted link attached to a long 5mm spring. The link has a tapered slot which fits into a groove in the pin. Grasp the link with a hook or pliers, pull it forward, and release it from the pin. Push the detaining toggle link off the pin. Stand the machine on its left-hand side. Remove all the screws from the right-hand support plate, then ease the plate off the ends of the tie rods. Lift out the detaining toggle reset link and the large L-lever. Recover 6 round spacers, including the thin-walled spacer inside the hub of the L-lever. Rotate the detaining toggle release bar support 27 half a turn to free the arms and lift out. Lift out the rock frame actuating shaft 2. Stand the machine on its back and remove tie rod F and spacers. Note the special grooved spacer under the detaining toggle at the left-hand side, and the rock frame actuating shaft support bracket and its short spacer near the centre. It is not necessary to keep the plain spacers in column order. Spread the two leftmost frame plates and carefully extract the detaining toggle assembly from its bearings. Disassemble the clearing handle mechanism on the support plate and set aside. Stand the machine on its back, with a suitable support to stop it falling backwards. Remove the keypieces, starting at the top right. Put on your safety glasses, place a finger firmly over the coil of the spring (in case it flies), and unhook the tail of the spring from the frame plate. Twist the keypiece to the right, release it from the key, and remove. Work from right to left, then down. The keypieces are all identical, but the springs are graduated in 4 steps from front to rear. Keep the groups in row order (1-2, 3-4, 5-6, 7-8-9) rather than column order to avoid having to sort the springs later. Put the machine back down and lift out the keys. Jiggle as necessary to clear the mechanism. Locate the keyplate retainer wires. There are two wires with right-angled ends on the left-hand side of the machine, in line with the two notches in the top of the outer frame plate, and another at the right-hand rear on Sterling (or ex-Sterling) machines. Pull out the wires and lift off the keyplate. Disengage the pin at the left-hand end of the release plate 14 from the forked end of the Mul/Div lever, unhook the spring to the keystop wire 13, and lift out the release plate. Note the arrangement holding the error release lever 15. Early models have 2 long wires 16 and 19, a clip over wire 16, and a coil spring to the key stop wire 13. Later models have 2 short crimped wires, 2 circlips around 15, and a torsion spring around 16. Remove the front wire 16 and the clip or circlips, align the grooves in 15 with the slots in the frame plates, and lift out. Withdraw the trigger stop wire 17 and the spring anchor wire 19. Push the trigger hanger wire 18 one place to the right and lift out the touch-off bar latch release lever from the leftmost (overflow) column. Remove the screw and short spacer at the left of tie rod G. Push the tie rod to the right and remove the Mul/Div lever assembly and the frame spacer which acts as a pivot. Push the lock lever stop wire 33 one place to the right and lift out the touch-off bar latch lever. Push wires 18 and 33 and tie rod G back into position. The key stops and accumulator interlocks. Prop the machine up on its back and disconnect all of the key stop springs from the inaccessible tabs on the side plates. Use two spring hooks or dental picks, and try to avoid deforming the loops. Try not to think about how you are going to get these back on later. Set the machine back down. Unhook the tops of all the tiny springs between the accumulator locking hook (ALH) and the pinion ratchet reverse lock (PRRL). The springs are at the top front, just below tie rod B. Withdraw wires 11, 12, and 13 to the left until clear of the right-hand column. Disengage the hook and tabs at the rear of the upper key stop and lift out. Turn the lower key stop to the left and lift out. Remove the ALH, PRRL, and the accumulator latch. Lift the subtraction cutoff lever up, across to the right, then out. Repeat to the end. Raise the front of the machine and unhook all the segment lever springs. Withdraw wires 23 and 24 and remove the springs. (This also releases the brake springs). Withdraw wire 29 and remove the brake levers. Lift the clip at the left-hand end of column lock retainer wire 21 and withdraw to the left. Withdraw the column lock pivot wire 22 and remove the locking hooks. Withdraw the thin crimped wire 30 to the right to drop the springs from the trigger retainers horizontal (TRetH). Lift the clip at the left-hand end of the 1/16" square touch-off bar 31 and withdraw to the left. Detach the spring from the left-hand end of the touch-off bar support 20. Push wire 32 to the right to clear the left-hand arm on the touch-off bar support. Spread the outer frame plates to disengage the pivots, then rotate the bar so that the arms align with the frame cutouts and withdraw to the left. Unhook the small springs from the trigger retainer vertical (TRetV, at the left of each column on wire 32) to the tabs on the frame plates. Withdraw wire 32 to the left and remove TRetH and V.
Remove tie rod G and the remaining spacers. From the rear, unhook the rear of the springs from the segment lever bell crank to the trigger connecting link and push the links off the pivot pins. From the front, withdraw stop wire 33 one place to the left to release the touch-off bar latching lever. Push the latching lever spring off the plain pin on the frame plate and remove the lever. Withdraw wire 18 one place to the left and remove the trigger assembly towards the front. Repeat to the end. Remove the left-hand screws in the bottom rear frame tie rods J and K. Invert the frame and lift the two internal feet away from tie rod J. (The feet have slots at the forward ends). Spread the left-hand support plate to clear tie rod K, then lift the tie rod, spacers, and feet out of the "U"-shaped slots in the frame plates. Withdraw the key stop lever pivot shaft 25 and remove the pairs of levers together through the rear of the machine. Withdraw the segment lever pivot shaft 26 and remove the segment and lock levers together through the rear of the machine. Number the frame plates before disassembly, or devise a method of keeping them in order. There are many subtle differences that can easily escape notice, especially in the earlier machines. Take note of the narrow end spacers between the frame and the outer support plates. Proceed carefully so as not to bend or distort the plates. Open the hinged retainer plates at each of the rock frame. Withdraw the carry gear pivot wire one place and lift out the carry gear, spring, and escapement wheel together. Release the spring tension carefully, and check that the escapement wheel makes at least a full turn (the initial preload was 1.5 turns). Unhook the large end of the spring from the pin on the carry gear. Repeat for the remaining columns. Turn the frame over, withdraw the escapement lever pivot wires, and remove the linked escapement levers. Withdraw the toggle lever pivot wire and remove the toggle levers and zero stops. Withdraw the locking dog stop wire. Note the arrangement of the outer (short) spacers and the location of the flanged locating spacers, then disassemble the frame. Please review the general information about cleaning and checking in the Notes on overhauling a mechanical calculator, and proceed as described. Use a large flat-bottomed dish for washing, and be very careful not to bend the long levers or the frame plates. Initial scrubbing all of the disassembled parts in kerosene will take about 6 hours. Please review the material on Reassembly in the Notes on overhauling a mechanical calculator. No special tools are required, but you will need to make some simple spring hooks from suitable fine wire. A fine pair of bent-nose pliers will be useful for re-attaching the subtraction cutoff lever springs. A pair of strong locking tweezers (or a surgical artery clamp) will be useful for holding some of the small parts securely during assembly. Several mechanism wires have retaining grooves which engage with flat spring clips. The clips and grooves are made in matched pairs of several different widths so that the correct wire can easily be found. Temporary follow-through wires can be cut from silver steel or "music wire" of 0.0625", 0.088", and 0.108" diameter from an engineering or hobby supply shop. In the notes following, tension springs listed as (eg) 3x10x0.3 are 3mm diameter, 10mm closed coil length, and 0.3mm wire diameter. All parts must be checked thoroughly and lubricated sparingly during assembly. Apply a thin film of oil to steel parts with a (slightly) oily rag to prevent rust, and apply light oil to gears, pivots and bearings. Reassembly is a painstaking process with lots of subtleties and hidden traps. If everything goes according to plan, it will take about 14 hours to prepare and check the washed parts and to reassemble and test the machine. Check the external threads and the special spacer nuts on the right-hand end of the large tie rods A,B,C,D and repair as necessary. Ease the outer diameter and/or the thread profile until the nuts can be run fully down with reasonable effort. Note that the nuts are counter-bored, with the threaded section to the outside. Remove the nuts. Fit screws and washers to the plain ends of three tie rods A, C, and D and insert them into the the left-hand support plate. Lay the plate flat on the bench and assemble the frame plates and plain spacers in order. Late models with the flat support plate start with 0.210" spacers on the left-hand side. Early models with the offset front section have no short spacers at the left of the main tie rods. Fit the two special formed spacers to rod A in the third or fourth column from each end, with the small hole for the rock frame helper springs towards the rear. Fit the special nuts and firm up gradually. Adjust the left-hand screws as necessary to leave about 2mm of the rod showing above the nut when the frame is tight. Place the right-hand support plate in position over the ends of the tie rods. Check that the ends of the rods are level with or just slightly above the surface of the plate, and correct if necessary. (If the rods extend more than the thickness of the washer it will be impossible to tighten the right-hand side). Temporarily fit the 3 screws and washers. Place the frame on a flat surface and check that everything is true and square. Check that the intermediate gear wire 7 (0.108") passes easily through the holes in the frame plates. Correct any tight spots by feeding a 7/64" drill bit in from the end and easing the hole on the side flutes of the drill. The wire should be free but not loose. Check the three rollers on the segment and lock levers and ensure that they are free. Proceed carefully if they are stuck, so as not to loosen the pivot pins. Freeing these rollers is very important, and can take a very long time. An hour in a large ultrasonic tank at 60°C may be helpful. Assemble the pairs of segment and lock levers, attach the bell crank springs, and install from the rear. Insert the lower pivot wire 26 (0.108"). Fit the pairs of key stop levers from the rear, passing them between the two arms of the segment lever bell crank. Locate them sideways at the rear by arranging the two short arms on opposite sides of the adjacent frame plate (ie, the outer lever wraps around onto the far side of the frame). Insert the upper pivot wire 25 (0.108"). Before lifting the frame off the bench, lift each segment lever in turn and insert tie rod F (without its spacers). This will provide a temporary stop to prevent the levers falling through and becoming tangled or damaged. Refer to the Model J pages for a description of the standard trigger operation. In the 3D11, the column lock retainer bar has been deleted, and the locks have been modified to follow the position of the touch-off bar directly. The locks are engaged when the bar is pushed rearward, and released when it returns forward. When the bar is pushed rearward in response to a short keystroke, a latching lever (Fig.21) drops and holds it in position via the notch at 123. The latch keeps the rest of the keyboard locked while the trigger is re-armed to complete the short keystroke. When the trigger is disarmed at the end of the downstroke, it lifts the latch via tab 124 and thus automatically releases the touch-off bar and the column locks. When the Mul/Div control is set for Add mode, an additional master latch (in the leftmost column) holds the touch-off bar until released manually by the push-button. Prepare plain wires 17 and 18 (both 0.088"), 32 (0.0625"), and 33 (0.108"); crimped wire 30 (0.055"); and tie rod G with plain spacers. Prepare the trigger assembly, trigger retainers H and V, and the touch-off bar latching lever (Fig.21) for the leftmost key column. Grasp the latching lever with pliers or tweezers and hold it in its approximate position near the centre of the column. The lever pivots on wire 33, with the long arm facing rearwards. Push the loop of its spring fully on to the plain pin on the frame plate to its left. Insert the pivot wire 33 (ie, the lock lever stop wire, 0.108") from the left. Place the trigger assembly in position. The pinned end with the spring faces forward. The rear end initially passes above the latching lever and the long connecting link passes below. Ensure that the rear end of the link lies between the segment lever bell crank and the frame to its left, and is not caught in any of the cut-outs in the frame plates. Insert the trigger hanger pivot wire 18 (0.088") from the left. Ease the rear arm of the trigger to the left and tuck it under the tab 124 on the left of the touch-off bar latching lever. Start wire 32 (0.0625") from the left. Place the trigger retainer vertical (TRetV, Fig.23) against the left-hand frame plate, with the curved end 138 forward between the trigger and the latch, and resting on top of wire 33. The hooked end 135 must be in front of the corresponding tab on the rear trigger arm. Feed in pivot wire 32 until flush. Fit the trigger retainer horizontal to the right of TRetV. The arms face forward, with the right-hand offset arm passing throught the cutout and to the right of the frame. The left arm sits above the vertical arm of the trigger. Feed in pivot wire 32 to retain. Repeat for the remaining columns, then insert the trigger stop wire 17 (0.088"). Connect the springs from TRetV to the tabs on the frame plates. From the rear, insert wire 30 (0.055", crimped at right-hand side) and attach the springs from TRetH. From the rear, attach the trigger connecting links to the pins on the segment lever bell cranks and connect the springs. From the front, install the brake levers onto wire 29 (0.108"). The long arm goes on the right, between the keystop levers and the segment lock lever, and rests against the rear of the large roller on the segment lever. Make sure that the arm is not caught behind the small roller on the lock lever. The short arm passes to the left of the trigger connecting link and helps to hold it onto the bell crank. Keep the brake lever springs to the top. Start wires 23 and 24 (0.088") from the left-hand side. The shorter front wire 23 has a groove at the left which engages with a spring clip on the second frame plate. (This arrangement was used on earlier models to provide clearance for the bell, and has been carried over even though the bell has been deleted). Attach the brake springs to wire 23, and hang the segment lever springs from both wires to align with the hooks below. Stand the machine on its left-hand side and connect the springs to the segment lever hooks. Check that the lock lever and segment lever are properly engaged, and the segment lever is held fully upwards against wire 33. The top of the gear segment should be level with the bottom of the hole for tie rod B. If not, it is probably because the brake lever roller is caught under a keystop lever. Arrange the keystop levers to the left of the columns and check again. Temporarily install tie rod B and the eccentric adjusting spacers. Set the spacers carefully to the half-way position, with the high points all horizontal and facing forward. Check that the lower rear tabs of all the triggers are behind the ramp 135 on TRetV and are not caught above the shelf. Check that the vertical arms of the trigers are under the arms of TRetH and are not caught in front. Check that the crossways horizontal arms on the triggers are resting on the vertical extension of the segment lever. (They may fall off the side until tie rod G is installed). When these checks are OK, check that the pins at the front of the triggers are all in a straight line horizontally and vertically. The tops of the front pins should be level with the top of the adjacent frame plate. If any are out of line, check first that the eccentric spacer is still set correctly. If necessary, adjust the rest position of the trigger by carefully bending the horisontal arm which rests on the segment lever with a suitable tool. Take a suitable flat-ended tool and press down on any set of key tabs near the front of the segment and lock levers. Check that the front of the trigger moves forward until it meets stop wire 17, then lifts upwards as the segment lever starts to descend. If the trigger fails to lift, check that the rear tab on the trigger is not caught above the horizontal shelf of TRetV. Press down again, and watch the engagement of the left arm of TRetH with the vertical arm of the trigger. The vertical arm starts out under the tip of TRetH, then moves forward and clear. Then simultaneously the vertical arm rotates rearwards and TRetH starts to descend. The tip of TRetH must end up sitting exactly on top of the vertical arm of the trigger, with no chance of getting caught behind during the simultaneous movement. Correct if necessary by carefully spreading the arms of TRetH. Press the segment lever again to bring the trigger to the armed position, then press down on the pin at the front. Watch and listen for two distinct clicks as both the trigger retainers drop into position. (Some movements may be stiff until more frame spacers are installed). Check again that the "feel" and movement of the triggers are identical in each column. When all is correct, insert tie rod G and carefully fit the plain spacers. Do not fit the end spacers or screws and washers yet. Touch-off bar and column locks. Prepare the touch-off bar support assembly 20 and the column locking hooks. Check that the cross-arms on the locking hooks are not bent or damaged, and the tiny spring-loaded arms are free to move. (Excessive force on locked keys will generally bend the cross-arms before it breaks the segment lever). Push the TRetH&V pivot wire 32 to the right until clear of the leftmost column. Feed the touch-off bar support assembly 20 into the large cutouts near the top centre of the frame plates, with the spring clips on the left-hand side and the arms facing forward. When fully inserted, rotate the arms down into the gaps behind TRetV, keeping them in front of the spring anchor wire 30. Spread the outer frame plates slightly and engage the pins on the end of the bar with their bearings. Check that the bar swings freely. Push wire 32 back home, through the hole in the left-hand arm of the support assembly, so as to limit the movement. Attach the spring 3x7x0.2 from the left-hand arm to the tab on the frame. Hold the leftmost locking hook with the movable arm at the top left. Press the segment lever down and hold. Lower the locking hook down into the column, pass the right-hand arm through the frame cutout, back up, and hook the tab over the frame plate. Release the segment lever and insert pivot wire 22 (0.088"). Check that the cross-arm of the locking hook is behind the fixed hook on the segment lever. Continue to the end. Insert the touch-off bar 31 (1/16" square) and the column lock retainer 21 (0.088", grooved) into the touch-off bar support arms from the left-hand side. Engage the spring clips with the grooves in the wires. Push the touch-off bar rearward and check that the locking hooks swing freely into position under the corresponding hooks on the segment levers. Release the touch-off bar and check that all the hooks move clear of the segment levers. Start at the left-hand side. Lift the first pair of key stop levers and insert a suitable wedge (eg a small screwdriver) into the rear pivots 25 to hold them up. Be careful not to distort the right-angle bends. Check the loops on the free ends of the keystop springs and re-form if necessary so that they are just slightly open. Fit the smaller keystop into the column with its short right-hand arm over the top of the frame plate. Engage the right-hand tab on the horizontal arm with the hook on the key stop lever. The left-hand tab sits above the trigger. Fit the larger keystop over the first, engage the hook, and feed in wire 13 (0.108", flats at LH side) to retain. Check that the tabs are still properly engaged. Check that the keystops are free to move and are not jammed against the segment lever. Repeat for the remaining columns. Prop up the machine on its back and connect the keystop springs to the tabs on the frame plates. Use a long thin hook to pull the loop of the spring up against the tab, and a wider hook to work the spring into position so that the loop can be slipped into the hole from behind. Ensure that the loop is fully engaged. Although it looks impossible at first, the springs can all be connected in about 10 minutes after a bit of practice. Remove tie rod B and the eccentric spacers. Prepare the subtraction cutoff lever, the accumulator latch, the accumulator locking hook (ALH) and the pinion ratchet reverse lock (PRRL) for the leftmost key column, and two plain wires 0.088" and 0.0625". If the parts have not been kept in column order it will be necessary to sort the sub cutoff levers into their original colour groupings. Attempts to rearrange the coloured buttons later will result in breakages. Pass the lower end of the subtraction cutoff lever through the frame cutout (top front) and move it across to the left into the outer (keyless) column. Move the lever down to engage its right-hand side with the small locating tab on the right of the frame plate. Insert wire 11 (0.088") to retain. Place the accumulator latch onto the end of wire 11, at the left of the active column. The long curved end passes under the keystop wire 13 and points upwards at the rear. Push wire 11 in until flush with the end of the latch, insert wire 12 (0.0625") to the same distance, and attach the latch spring to wire 12. Engage the fork on the rear of the accumulator locking hook with the pin on the front of the trigger, then lower the ALH down into position. Push wire 12 into the left-hand arm only. Place the pinion ratchet reverse lock inside the arms of the ALH, with its long arm downwards on the right. Feed in wire 12 to retain, then attach the tiny spring between the PRRL and ALH. Repeat for the remaining columns. Replace tie rod B and the eccentric spacers. Re-set the cams to the half-way position with their high points facing forward. Check that all the segment levers are resting against the underside of the spacers. Assemble the acumulator for the leftmost column (with a plain spacer instead of the pinion ratchet) and place it in position. Feed in pivot wire 5 (0.088") to retain. Assemble the accumulator for the next column. Hold the assembly in tweezers so that the deep cut on the pinion is one tooth forward of the top. Press down on the rear of the accumulator latch to provide clearance, then ease the accumulator up into position. Engage the pinion with the segment rack and feed in the pivot wire. Check the deep tooth alignment and correct if necessary. Continue to the end. Check again that all the pinions are aligned identically. Prepare the backstop, backstop spring, carry lever, and latch lifter for the rightmost column. Ensure that the carry lever roller and the three rivetted levers all move freely. Start the backstop wire 6 (0.088") from the right-hand side. Place the backstop in position over the lantern wheel and feed the wire into the right-hand arm only. Place the backstop spring between the two arms, with the hooked end upwards at the right. Advance wire 6 through the coils. Note that backstop in the rightmost column has a stronger spring (0.015" wire diameter in the first column, 0.0115" in the rest). Place the carry lever assembly in position beside the backstop and advance wire 6 into the right-hand arm only. Place the latch lifter between the arms of the carry lever, with the cut-away section at the top left and the rearward arm under the tab on the latch lever. Advance wire 6 to the next column and continue to the end. Support the front of the machine a few inches off the bench. Press the top of the backstop spring back and down with a finger, catch the end from underneath with a fine spring hook, and sit the end of the spring on the edge of the frame plate. Remove your hook, then push the end of the spring to the right so that it hooks over the frame. (If you put the spring in position directly you will have trouble removing your hook). Ensure that the spring is securely hooked over the frame, then continue to the end. Fit the top front tie rod E and the special formed spacers with the rolled lip pointing upwards at the front. Ensure that the top arm of the carry lever is below the rear of the spacer and not caught above. Insert the carry spring retainer wire 8 (0.0625") and attach the carry lever springs. The springs must come off the top of the tab on the carry lever, not from the bottom or side. The top loops should be on the left so that the springs do not rub on the upper arm of the lever. Lift the flanges up against the wire. Lift the bottom rear pawl of the carry lever and push it rearward, so that it passes above the segment lever roller and engages with the lantern wheel. Temporarily insert the intermediate gear shaft 7, which acts as a forward stop for the carry levers when the segment lever is lowered. Check the the fine torsion springs on the carry lever are still in position. While carrying out these checks it is necessary to keep the accumulator latch clear of the accumulator gear. Lift the front of the latch with a small hook, or press down on the rear end without touching the trigger. When fully assembled, the latch will be raised by the latch lifter whenever the rock frame is engaged. Insert a No. 3 key in the leftmost column, between the key stop levers and the lock lever, with the right-hand shoulder above the third operating tab on the lock lever. Lift the accumulator latch and slowly press the key fully down. Watch and listen for the trigger retainer operation as before. Let the key rise very slowly, and check that the backstop drops over the third lantern wheel pin just as the segment lever reaches the top of its stroke. If necessary, fine adjustments can be made to the eccentric spacer to provide positive operation with minimum clearance. If larger or unobtainable adjustments are needed, it is likely that the pinion deep tooth alignment is incorrect, or the pinions and lantern wheels have been mixed and are no longer paired correctly. Make a full keystroke (down and back) and check that the accumulator latch drops cleanly between the teeth of the accumulator gear when the rear of the latch is released (ie, the lantern wheel should not move). Partially depress the key so that the pinion ratchet only advances 2 clicks, then let the key rise slowly. Check that the trigger operates the column locking bar as the lock lever rises. You should hear another click as the touch-off bar latching lever drops into place. Press down slowly to complete the keystroke, and check that the column locking bar resets as the keystop presses down on the trigger, just before the key reaches the bottom. Check again that the trigger retainers H and V drop into position at the bottom of the keystroke, with sufficient excess movement to ensure reliable operation. Press each carry lever rearwards and check that it returns fully when released slowly. Repeat 10 times to check every bar on the lantern wheel. If the lever stops half-way, check for tight pivots, damaged or mis-placed springs, burred pawls on the carry lever, or damaged pins on the lantern wheel. If these are all correct, increase the clearance for the overrun pawl by setting the segment lever eccentric stop a little lower, then re-check that the backstop still operates at the top of the stroke. There is a fairly limited range in which both adjustments will be correct. Push tie rod G and wires 17, 18, and 33 to the right until clear of the leftmost column. Fit the touch-off bar master latching lever to wire 33, making sure that its long rearwards arm is above the touch-off bar 31. The lever is similar to the the column latching levers in Fig.21 above. Put the release plate 14 in position above the keystops, with its fingers facing upwards from the rear of the shaft. Engage the pinned ends with the bearings in the outer suport plates, then attach the spring 3.5x7x0.3 to the keystop wire 13. Insert a plain frame spacer into the hub of the Mul/Div lever assembly and place it in position on tie rod G. Engage the forked arm into the groove near the left-hand end of the release plate. Push the release plate rearwards to horizontal and check that pressing further pulls the Mul/Div lever forward (via the pin next to the forked arm). Fit the narrow spacer and screw at the left of tie rod G.
Hold the latch release lever with the straight arm vertical on the right. Lower the curved arm down into the column and start the trigger hanger wire 18 into the right-hand side. Attach the spring 3x15x0.2 from the latching lever to wire 18, then feed the wire right through. Rotate the release lever so that the long curved arm comes up under the rear of the latch lever, then tuck the forward arm under the tab on the left-hand end of the release plate 14. Attach the spring 3x15x0.3 from the latch release lever to wire 19 (0.088", crimped on left, short on later models). Attach the spring 3x16x0.4 from the bottom of the Mul/Div lever to the trigger stop wire 17. Fit the error release button shaft 15 to the slots in the top of the frame plates. Early models have a clip to a frame plate secured by the second crimped wire 16, and a tension spring 3x28x0.2 to the keystop wire 13. Later models have two circlips around the shaft 15 and a torsion spring around wire 16. Press the Mul/Div lever down and rearwards and check that it latches under wire 16, then pull it forward to disengage. Push the touch-off bar 31 rearward and check that the master latch operates to hold it in position. Press the error release button and check that the latch releases. Engage the latch again, press down on the release plate 14 to simulate clearing the machine, and check that the latch releases. Engage the Mul/Div lever. Push the touch-off bar rearward and check that it does not latch. Press down on the release plate and check that the Mul/Div lever disengages. (A field service modification was available so that the Mul/Div lever would remain engaged until released manually. This involved removing the pin at the left of the release plate so that the forked arm would not be drawn forward when the machine was cleared). Fit the short tie rod I with plain round spacers. Fit washers over the tie rod at each end and firm up the screws. Be careful not to over-tighten any of the small tie rods. These rods are only 5/32" aluminium with a coarse 7/64" internal thread. There is only 0.023" of metal on each side, which can easily be pulled apart by over-enthusiastic tightening. A machinist can repair or replace a broken rod, or a home-made replacement can be cut from 5/32" steel with external threads, nuts, and washers at each end. Make sure that the replacement rod does not interfere with the mechanism retainer plates. Flip the machine over (front to back), with a suitable support to keep the subtraction buttons off the bench. Fit tie rods J and K (with two internal threads) and plain spacers. Replace the two internal feet and the short spacers in the original columns. Look for the oil stains on the frame plates to locate the feet, or match the feet with the impressions in the lining of the base. Start tie rod H and fit the formed spacers. The open side of the spacers faces the baseplate, with the small folded tab towards the rear of the machine. The spacers must be aligned correctly to avoid restricting the movement of the No. 6 keypieces. Stand the machine on its left-hand side and remove the right-hand support plate. Check that the bearings for the release plate 14 and the rock frame actuating shaft 2 are still firmly rivetted to the plate. These bearings take a considerable load as the machine is cleared, and sometimes become quite loose. Repair as necessary. Assemble the clearing handle mechanism on the support plate. Adjust the inner sleeve to provide free movement with minimal side play. Place the detaining toggle release bar support 27 in its bearing in the left-hand suport plate, with the clip at the left-hand side and the arms facing outwards. Then rotate the bar so that the arms face straight up into the mechanism. Arrange the links on the rock frame actuating shaft 2 so that the triangular bell crank for the shutter reset mechanism sits above the longer slotted link, as shown opposite. Place the shaft assembly in its bearing in the support plate, with the links above the shaft and facing forward. Ensure that the leftmost links are above the front foot. Place the spacers on all the tie rod ends, matching the heights to the tie rod nuts and the offsets in the support plate. Later models have a flat plate with all nuts and spacers 0.25". The spacer with the reduced outside diameter goes on tie rod H. Fit the detaining toggle reset L-lever over this spacer, with the connecting link towards the rear. Fit the support plate over the tie rod ends. Check that the outer rock frame links are above the front foot. Engage the rock frame actuator shaft, release plate, and detaining toggle release bar with their bearings and their clearing mechanisms. Check that the support plate sits flat across the spacers. Fit the large screws and washers to tie rods A,B,C, making sure that the washers are centred over the rods. Firm up the screws in rods A,B,C from both sides, then check that the rock frame actuator and the detaining toggle release bar still have a small amount of end play. Place the machine back on its feet, with a block under the front to protect the rock frame links. Check that the release bar has a (very) small amount of end play. Check that the reset arm at the right of the release plate is aligned with the clearing arm below, and has no chance of slipping off. Check that the release plate fingers are properly aligned with the rear ends of the accumulator locking hooks. It may be necessary to loosen the right-hand side, lift the release plate, and adjust the hooks and/or triggers sideways to ensure positive engagement. When these adjustments are correct, fit the remainder of the screws and tighten from both sides. Make a full and a short keystroke in every column (as described under "Trigger and accumulator checking" above) to check that tightening the frame has not caused anything to bind or stick. Stand the machine on its back, with a suitable support to stop it falling backwards. Assemble the two parts of the detaining toggle and place in approximate position behind tie rod F in the leftmost column, with the long link rearwards and above the central tie rod H. Spread the frame plates and ease the short shaft into the bearing holes 1. Place the long link from the detaining toggle between the two tabs on the left arm of the release bar assembly 27. Insert the plain end of the release bar 28 (0.088", grooved) to hold the link in place. Push wire 28 through to the right-hand side and engage the link from the clearing mechanism. Check that wire 28 is behind the tails of the brake levers and properly engaged with the clip on the left-hand side. Place the short forward link from the detaining toggle onto the grooved pin on the operating arm near the left of the rock frame actuating shaft. Connect the spring 4x40x0.4 from the detaining toggle to the tab on the leftmost frame plate. Connect the larger spring with the slotted link to the post at the top centre of the leftmost frame plate. Pull the link forward with a spring hook and fit the slot onto the grooved pin at the left of the rock frame actuating shaft, so as to retain the link from the detaining toggle. Fit tie rod F and plain spacers. The leftmost spacer has the diameter of its centre section reduced from 0.025" to 0.020" to provide an over-centre stop for the detaining toggle. Fit the rock frame actuating shaft support plate and short spacer near the centre of the tie rod - look for the oil stain on the frame plates. Place the machine back on its feet, with a block under the front to protect the rock frame links. Carefully pull the clearing handle forward, making sure that the rock frame links do not catch on the frame or the carry levers. Check that the handle moves and returns freely. Insert a key in any column and check that the detaining toggle releases. Check the carry lever locking dogs (rivetted to the rock frame plates) and ensure that they move freely. Assemble the tie rods, frame plates, and spacers according to your map. Fit the screws but do not tighten yet. Place the rear (wide) side flat on the bench with the curved end plate to the left. Fit the pairs of escapement levers with their short arms under the clip at the left-hand side. Note that there is a special pair for the leftmost (overflow) column. Fit the toggle lever and zero stop assemblies. There is a narrow lever at the left, one with a spring clip at the right, and levers with actuating forks in alternate columns between. If the toggle levers and zero stops have become separated they are best assembled on the end of a spare wire held in a vice, as the torsion springs are quite strong. Turn the frame over and insert the locking dog stop wire. Close the retainer plates at each end and insert the intermediate gear shaft 7 (0.108") through the top holes. Hold the frame against a flat surface and tighten the screws from both ends. Be careful not to over-tighten. Remove wire 7 and open the retainers. Be careful not to twist the rock frame during further operations. Identify the special escapement components for the leftmost column. The escapement whel is obviously different, the carry gear has a shorter hub, and the spring wire is 0.012" diameter compared to 0.013" in the operating columns. There will be problems if this weaker spring is used by mistake in a normal column. Check that the roller at the front of the carry gear cam turns freely, then assemble the carry gear, spring, and escapement. Wind the spring until the escapement arm passes the stop on the gear twice (ie, at least one full turn), then fit the assembly into the frame and insert the pivot wire. Hold the zero stop clear of the carry gear stop pins, rotate the gear by hand, and check that the escapement wheel follows half a turn at a time. Close the retainer plates. Support the front of the machine on a suitable block. Push rearwards on the detaining toggle release bar 28 to release the toggle. Check that the outer rock frame actuating links are resting on the front feet and the inner links are hanging below the frame. Take the leftmost shutter reset link (the one with the tiny spring clip) and hold the link vertically, with the curves forward and the bottom tab offset towards the left. Insert the straight end into the leftmost (overflow) column, between the left-hand frame plate and the accumulator gear and behind the accumulator shaft. Fit the remaining links in alternate columns to align with the rock frame actuating links below. Ease the links down between the subtraction cutoff lever and the accumulator latch so that they sit on the accumulator shaft at the same level as the first. Check that the lower ends of the links are on the right of the frame plates and not caught in the cutouts. Starting from the right-hand side, fit the curved shutter links to the left of the vertical links, with the tab curled over the top and the free end facing forward. Insert wire 10 (0.075", narrow groove at left) from the right-hand side to retain. Engage the clip at the left with the rear of the groove. Check again that the intermediate gear shaft 7 (0.108") passes freely through the holes in the top of the rock frame and the corresponding holes in the main frame plates. Correct any tight spots by feeding a 7/64" drill bit in from the end and easing the hole on the side flutes of the drill. Check that the formed spacers on tie rod E are hard up against the carry spring wire 8. Loosen the tie rod and correct as necessary. Take a piece of 1/16" rod and cut it to the width of the rock frame. This will be used as a temporary locking rod to keep the mechanism at zero during installation. Support the front of the machine at an angle of about 15°. Push rearwards on wire 28 to release the detaining toggle. Press rearwards on the front arms of all the accumulator latch lifters so that the rear arms stick in position up under the latches. Place the rock frame on the bench with the forked levers to the top and the carry gears behind. Push the forked end of the right-hand toggle lever rearward against the tie rod, then draw the carry gear upwards until the spring is under tension. Lift the toggle lever so as to engage the zero stop, then insert the temporary locking rod through the hole in the toggle lever. Insert a suitable wedge (eg folded paper) under the front arm of the toggle lever to hold the locking wire down against the frame, as illustrated opposite. Continue to the end, with a couple more wedges as required. Check that all the zero stops are standing about half-way under the stop pins on the carry gear. Serious misalignment can be corrected by carefully bending the small spring-loaded tabs between the zero stop and the toggle lever. Do a final check that all the carry gears are still under tension, the carry levers are still engaged with the accumulators, the fine torsion springs on the cary levers are still in position, and the latch lifters are still rearwards. Hold the rock frame at each end and carefully insert the lower arms under the carry levers. Rotate the bottom rearwards until the leftmost escapement lever sits over the toggle link attachment point, as shown for removal. Let the rock frame sit in this position while you place the intermediate gears into the gap at the right of the carry gears. The recessed side of the gear faces to the left. (It is not strictly necessary to put the intermediate gears in position at this stage, as they can be installed later from the top. However, when it becomes necessary to remove and replace the rock frame for maintenance the top access will be blocked by the numeral wheels. This slightly more complex procedure can be used in both cases). Swing the top of the rock frame inwards under the top spacers, then rotate it inwards and upwards to engage the lateral locating flanges on the top tie rod with the main frame plates. Difficulties may be caused by the lower arms fouling on the actuating links, the toggle links fouling on the attachment rivets, or the temporary locking wire being too long. When the rock frame is in position, start wire 7 (0.108") from the right and a temporary 7/64" pin from the left. Check that the rock frame swings freely back and forth. Push the rock frame rearwards and check that all the accumulator latches lift slightly. (This is easiest if you look at the rear of the latches, under the release bar). If any fail to move, remove the pivots, draw the rock frame forward, and push the recalcitrant latch lifters down behind their operating pins. Replace the pivot wires and check again. (The latch movement is quite small until the temporary locking wire is removed). Pull the rock frame forward and connect all the toggle links and levers to wire 4 (0.075", with a ring or groove at right-hand side). Remove the temporary locking wire and the toggle lever wedges. Remove the temporary pin, stand the machine on its left-hand side, and connect up the rock frame actuating links. Starting at the top, engage the shutter reset link with the pin at the rear of the triangular bell crank. Engage the pin on the slotted actuating link with the fork on the rock frame toggle lever. Align the hole in the bell crank with the slot in the link and feed the supporting wire 3 (0.088") through both. Rotate the actuating shaft slightly to align the holes. It gets easier after the first couple are in place. The wire should pass easily through all the links without forcing. Attach the two helper springs from the toggle wire 4 to the formed spacers on tie rod A. Loosen the tie rod and adjust the spacers so that there is a slight tension on the helper springs. Place the machine back on its feet and replace the temporary pivot pin. Carefully operate the clearing handle, freeing the shutter links if they become caught. Check that the rock frame moves forward and that the detaining toggle locks over-centre. Check that the clearing handle still returns freely. Push rearwards on wire 28. Check that the detaining toggle releases, the rock frame snaps down and rearwards, and the shutter reset wire rises evenly about 5mm. Free the curved links if they become caught. The rock frame movement must be quick and positive. Look in from the left-hand side and check that the large carry gear is fully engaged with its accumulator gear. Clear and release the rock frame again. Examine the small toggle links 4 closely to ensure that they are all fully over-centre and can not be pushed down any further. Differences from one end to the other generally mean that the rock frame is twisted. Correct as necessary so that the rock frame toggles all engage fully when the detaining toggle is released. If the rock frame does not engage fully, the problem may be in the actuating links or in the engagement of the gears. The zero position of the carry gear depends on the zero stop levers and the zero studs, which may be loose or damaged. The zero position of the accumulator gear depends on the eccentric spacer setting and the alignment of the pinion deep tooth. Mis-alignment can cause a pair of gears to clash tip-to-tip and prevent the rock frame from engaging properly. Locate and correct any errors before proceeding. Readjust the helper springs so that they are still under a slight tension when the rock frame is fully engaged. If the machine has coloured numeral wheels, arrange them in order to match the keytops. Note that the wheels are not all the same, due to the shorter hubs in the columns with the shutter reset links. Clear the machine. Starting at the left, place the shutter assembly inside the numeral wheel and ease it into position from the front. Pass the long arm (the sub cutoff latch) through the frame and up against the pin on the sub cutoff lever. Pull the assembly forward and arrange the short rearward arm in front of the shutter reset wire 10. Start the numeral wheel pivot wire 9 (0.0625") from the left and engage it with the curved shutter link. Align the wheel and shutter and feed the pivot wire through. Check that the wheel spins freely - ease the frame plates if necessary. Connect the stiff spring from the sub cutoff lever to its latching lever. Pull the loop forward with a spring hook and twist the end into the hole with a pair of fine bent-nose pliers or similar. Ensure that the loop is properly formed and fully engaged. Fit the sub cutoff latch release lever flat against the right-hand side plate, with the lower offset arm to the right of the carry lever spring. Engage the forked end with the locking dog stop wire in the rock frame (immediately below the top tie rod), then ease the top end rearwards past the shutter operating arm. The arm should then drop freely into position without binding or sticking. Install the remainder of the numeral wheels, shutters, and latch release levers. Hold the rock frame in position and swap wire 7 to the left and the temporary pin to the right. Set the leftmost numeral wheel to zero, lift the intermediate gear so that it engages with both the numeral wheel and the carry gear below, and feed in the pivot wire. The hollow zero should be centred over the silver section of the shutter behind, and just slightly forward relative to the raised section on the frame plate. Push the intermediate gear to the left, then pull back the pivot wire to leave a gap between the gear and the frame plate to its right. Take the shutter release lever and check that it is not bent or twisted. Check that the roller turns freely, and that the fine torsion spring is properly located in its groove. Wind the spring clockwise so that both ends are in front of the side tab, hold the spring with your thumb, then insert the left-hand arm and roller into the gap in front of the intermediate gear hub. Slide the arm downwards and rearwards into position. When you have to let go of the spring it should stop on the top tie rod, then finally come to rest in the notch at the right of the sub cutoff latch release lever. Align the levers and feed in the pivot shaft from the left. Continue to the end. Insert a key (eg 3) in the leftmost column, between the key stop levers and the lock lever, and above the operating tabs on the lock lever. Make several full strokes of the key and check that the mechanism operates as expected. Check that the tens-carry proceeds into the next column. Make short strokes and check the operation of the touch-off bar, column locks, and release button. Repeat for the remaining columns. Check thoroughly, as the trigger and eccentric spacer adjustments will be inaccessible after the keyplate is fitted. Clear the machine and check that all the zero shutters are closed. Press a key in the rightmost column and check that only the rightmost shutter opens. Clear and repeat in each column, checking that all and only the shutters to the right of the column will open. Adjust the cascaded shutter levers as necessary so that they trip and reset correctly. Clear the machine and use a 9 key to enter 999...999. Press the rightmost subtraction cutoff button and check that it latches rearward. Add 1 in the rightmost column. Check that the numeral wheel advances to 0 without producing a carry, and that the cutoff button springs forward. Repeat for the remaining columns. Press all of the subtraction cutoff buttons rearward so that they latch in position, then check that they are released when the clearing handle is operated. Check the locating tabs under the keyplate, and the places where they engage with the tops of the frame plates. Any distortion or misalignment can make it difficult to insert some of the keys and may cause the columns to jam. Engage the front of the keyplate under the tabs at the front of the frame plates, then lower the back. Look in from the rear to check that the locating tabs are properly engaged. Check that the plate sits flat all round. Insert two retainer wires (with right-angled ends) from the left, through the notches in the top of the leftmost frame plate. Insert the third retainer at the right-hand rear of Sterling (or ex-Sterling) machines. Leave the end of the central wire outside the leftmost frame plate, so that it can not interfere with the touch-off bar support. Prepare the keys in their colour groups and drop them into the keyplate. The hooks at the bottom of the keys should be flat, but resist the temptation to straighten the 1 keys. The bends are deliberate, to provide clearance from the upper keystop. Prepare the keypieces and graduated springs. Springs for rows 1 and 2 are 0.028" diameter, 3 and 4 are 0.0265", 5 and 6 are 0.025", and 7, 8, and 9 are 0.023". Wear eye protection while handling the springs. Support the machine vertically on its back. Start at the top left (as you look at the underside) and check that the 1 keystem passes between the key-stop levers and the segment lock lever. Engage the right-hand leg of the keypiece in its slot, fit the hole over the keystem, then engage the left-hand leg. Place a finger over the coil of the spring (to stop it flying off), then hook the tail of the spring under the tab near the left foot. Push the spring fully to the left on the supporting pin so that the coils can not work loose. Proceed left to right, then down. With the machine still vertical, press every key and check for any problems. The keypieces are quite soft and are easily bent out of shape (and back again). Make full keystrokes and check for keypieces that rub against their neighbours or adjacent keystems. Make short keystrokes, moving only the lock lever, and watch carefully for keys that do not return fully. This problem is usually due to the keypiece holding the keystem too far to the left, causing the key stem to bind on the horizontal flange on the frame plate. Straighten the keypiece or adjust its left foot to correct. Keys and keypieces can be removed individually - it is not necessary to disassemble the entire keyboard. Problems can also be caused by incorrect fitting of the keyplate so that the locating tabs distort the frame plates and cause the keys to bind. When all seems correct, place the machine back on its feet and check again. Check the adding, carry, and duplex operation by adding all the numbers on the keyboard, 3 at a time. Start with the leftmost three 9s, then the 8s, and so on down the column, then the next three columns, etc. The result should be 499...995. Add 1 five times and check that the ripple carry proceeds quickly and smoothly across the whole register. Test extensively before refitting the casing. Cut new rubbers (if necessary) for the locating lugs on the baseplate, and fit a new tranparent window to the top cover. Repair any bent or damaged decimal indicators. Invert the machine and set it down on a soft cloth. Fit the baseplate with 4 screws through the rubber feet. Set the machine down on the base. Fit the mechanism wire retainer plates with 3 screws each side. Fit the top cover, lay the machine on its side, and fit the small screws around the edge of the base. Note that there is very little clearance between the top cover and the back of the segment levers, to the extent that any damage to the cover or to the sound deadening material can cause the segment levers to bind. Check the operation of each column after fitting the cover, then fit the control buttons. A numeral wheel was free when installed, but now only moves half a gear tooth. This is generally due to the spacer on tie rod A being set incorrectly, so that its rear edge fouls against the intermediate gear. It can also be due to the latch lifter not being properly engaged with the operating pin on the rock frame, so that the intermediate gear catches on the edge of the cut-away section. It is necessary to remove the rock frame to correct the latch lifter engagement. incorrect engagement of the keyplate locating lugs, causing distortion of the frame and binding of the keystems. A column has keys 2 to 9 locked, but the 1 key operates correctly. This is caused by the rear of the 1 keystem pressing against front edge of the upper keystop and holding it engaged with the segment lever. The segment lever can only move down as far as the first stop, which is sufficient for the 1 key but not for any of the others. Remove the key and carefully increase the curvature - concave side towards the rear. A column passes from 9 to 0 without producing a carry. Check first that the subtraction cutoff lever is not in contact with the underside of the carry lever. Check the carry lever spring, as excessive tension can prevent the lever moving fully. Make sure the spring is attached to the top of the lug on the lever, and is not caught around the sub cutoff latch release lever. If these are correct, the escapement wheel (in the rock frame) will probably be caught behind the duplex lever. Check that the duplex lever is not stiff or sticky and that the torsion spring has not been displaced. If necessary, adjust the eccentric spacer to allow the segment lever to rise slightly more, thus lowering the front of the duplex lever. If significant adjustment is required it is best to remove the rock frame and check the escapement wheel, carry lever, and the trigger adjustments. Many intermittent errors can occur if the carry lever does not return promptly, or does not latch correctly under its locking dog at the end of its return stroke. When the column is operated the overrun detent may pull the carry lever rearward, causing an erroneous carry into the next column. Check first that the locking dog is free to move, and that the carry lever spring has not been stretched or damaged. If these are correct, the problem may be due to the segment lever zero position being set too high. Insufficient clearance between the lantern wheel and the segment lever roller results in the carry lever spring working against the overrun pawl torsion spring as it attempts to pull the carry lever forward. Adjust the eccentric stop to lower the segment lever slightly. Note that this is the opposite of the previous adjustment - there is only a small range in which both will be correct. The previous problem is more difficult if it occurs in the leftmost (overflow) column, as there is no segment lever to adjust. (The detent lever slides over a fixed pin attached to the frame plate). Remove the rock frame and polish the sliding surfaces, or ease the top of the pin slightly to provide clearance. The best way to keep a Comptometer in good working order is to exercise it regularly, and to re-lubricate whenever it shows signs of slow or sticky operation. Exercise the machine by adding all of the numbers on the keyboard, 3 at a time. Start with the leftmost three 9s, then the 8s, and so on down the column, then the next three columns, etc. The result should be 499...995. Add 1 five times and check that the ripple carry proceeds quickly and smoothly across the whole register. Lubricating the cross-shafts of a Comptometer is done with a set of follow-through wires of 0.0625", 0.088", and 0.108" diameter. Clean the 1/16" wire, apply a drop of oil to the front, and use it to push the numeral wheel pivot wire 9 out of the machine. Clean the original wire (with fine emery cloth if necessary), apply a drop of oil, and push it back from the opposite direction. Repeat as necessary until the wire comes out clean. Repeat the same process with wires 5, 6, and 7. To clean and lubricate the carry gear pivot wire in the rock frame, the intermediate gear wire 7 must be replaced with a temporary follow-through wire. The temporary wire must be shorter than the rock frame, so that the two hinged retainer plates at the ends can be opened at the same time. Then follow the same procedure. Wires whose parts have more limited movement (eg 11, 13, 18, 22, 25, 26, 29, 32) can be lubricated less frequently. Be careful with the wires (eg 13) that are also used as spring anchors. Remove the baseplate, invert the machine, and apply a small drop of oil to the side of each lantern wheel, so that it runs in and lubricates the pinion ratchet. Use a small artists brush to apply a minimum amount of oil to the other moving parts, pivots, and bearings, including the carry lever locking dogs and the rock frame toggle links. Exercise the machine again to distribute the oil before replacing the covers. Original text and images Copyright © John Wolff 2004-12.